I'll rescue you from dusty ground. A smile to cheer and eyes to shine. Keep the ghosts and ghouls at bay. Guide me home this Halloween. The moment I cut into a pumpkin, I'm instantly transported back in time. It's Halloween morning, and the kitchen table is strewn with old newspapers. My father is there, in an old t-shirt, carefully zig-zaging his knife through the top of what will soon become my Jack-o'-lantern. My brother and I - eyes wide and sparkling in anticipation - are watching patiently as the knife glides back and forth, up and down. 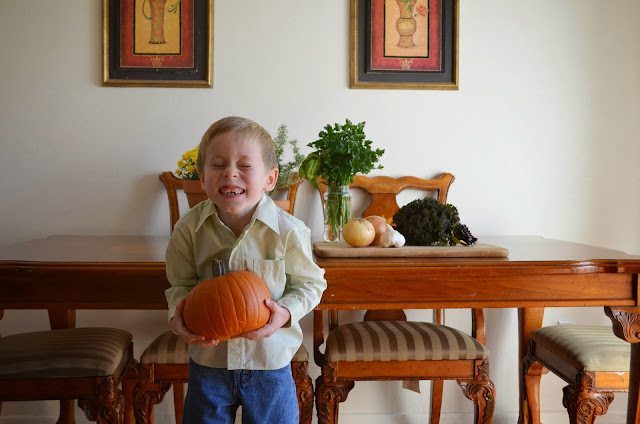 He removes the lid and passes the pumpkin to me. I reach in my tiny hand, sleeves rolled up past the elbows, and wrap my little fingers around a cold, slick mass of seeds. As I pull it out, the wet strings slide through my fingers. And that scent surrounds me! That glorious, quintessential aroma of fall! The smell of fresh cut pumpkin, of toasty Jack-o'-lantern scorched by candle flame, of brisk, cold nights and candle wax. 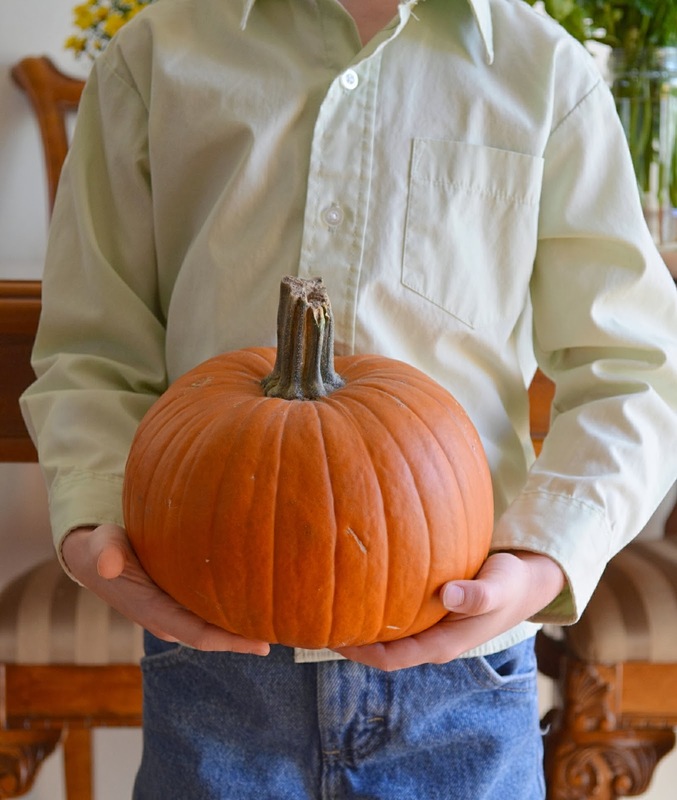 Like magic, I relive the moments over and over again, whenever I cut into a pumpkin. Perhaps that's why I love to fill my house with pumpkins, though I've never been crazy about eating them. There's such a fairy tale quality about them. Like Cinderella's enchanted carriage, there's something magical lying just beneath the surface. They're never exactly as they seem, and they can transport you to places of wonder, rekindle lost memories. At least their aroma can. Of course, when you have that many pumpkins lying about, you must start cooking with them. The weather turned bitter and cold last weekend. The wind howled across the eves and the branches thrashed against the side of the house in what sounded like a wicked, haunting chant. Perhaps it was my overactive imagination, but I swore they were saying "pumpkin soup, pumpkin soup." 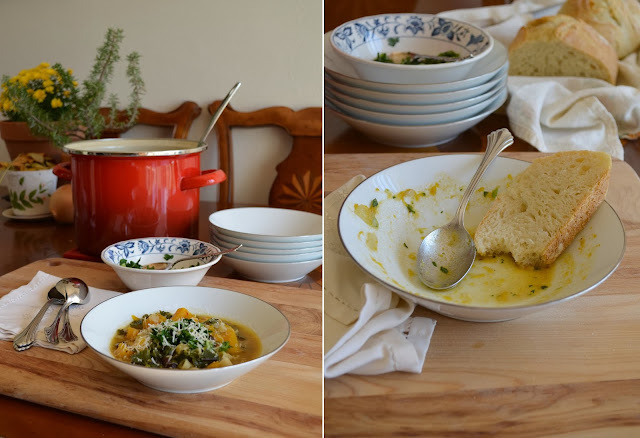 And what do you do when the icy wind is telling you to cook? You make pumpkin soup! 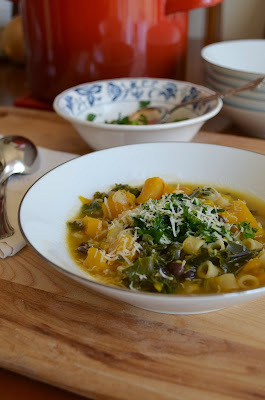 I have a favoutite fall soup recipe made with canned pumpkin and black beans. I wanted something a little heartier, more substantial. 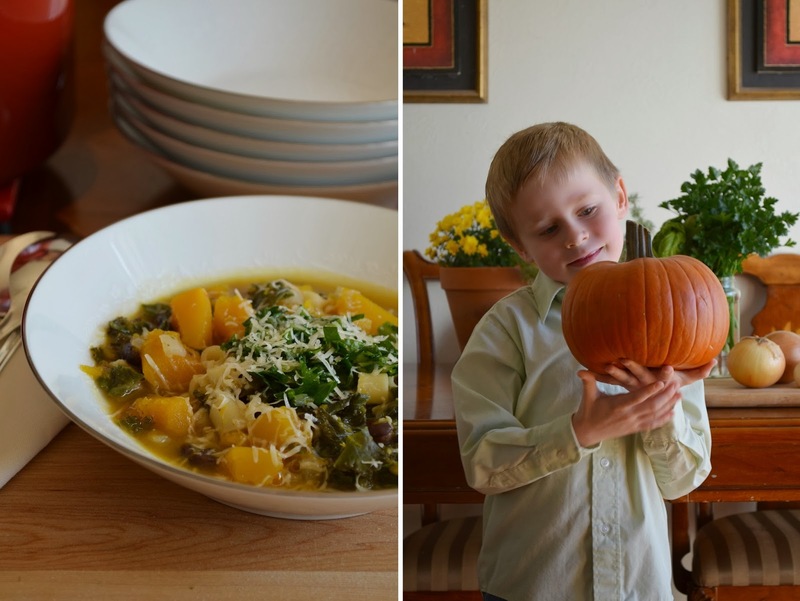 So I made a big pot of this pumpkin and black bean minestrone. Laced with kale, and dotted with little ditalini pasta, it's a cross between a soup and a stew. And it's warm and filling. Perfect for a cold, blustery Colorado afternoon. Of course, always cook with little, sugar pumpkins. The smaller, the better. Their flesh is smooth, sweet, and tender, unlike the large, Jack-o'-lantern pumpkins which are stringy and not at all pleasant to eat. Naturally, when you have a meal of soup you need something with which to wipe bowl clean. I've been raving about this 5 Minute Artisan Bread on facebook for the last few weeks. It's not my recipe, though I wish it was because it's just so brilliant! It's from the book Artisan Bread in Five Minutes a Day, and it's an essential for anyone who's avoiding nuts. The dough is made ahead of time and sits in the fridge (up to 14 days!) until you're ready to use it. Then simply pull a piece off. Shape it into whatever loaf tickles your fancy, let it rise, and bake it off in your NUT-FREE kitchen. Voila! An artisan loaf that's guaranteed to be nut-free, and is easy as pie. 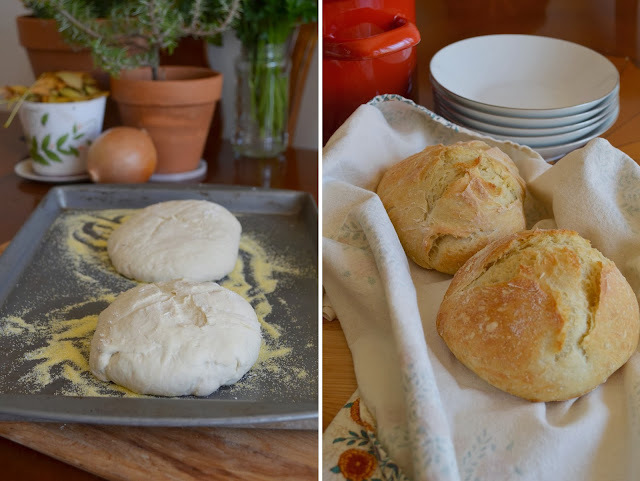 I've made so much with this recipe, from dinner rolls, to baguettes, to donuts and zeppole. It's a life saver! Follow the recipe to a T and you won't be disappointed. In a large soup pot, heat 1 tablespoon of olive oil over medium heat. Add the onion and garlic with a large pinch of salt, and cook until soft (about 5 minutes). Add the pumpkin, coriander and red pepper, and cook a minute or two longer, until the coriander is fragrant. Pour in the chicken broth and bring to a simmer. Cover and simmer for 15 - 20 minutes, until the pumpkin is soft. Stir in the beans, pasta, and chopped kale. Cover and cook another 10 minutes. Taste for seasoning and add more salt and a little black pepper if necessary. Meanwhile, finely chop the parsley and green onions together. Place in a small serving bowl and pour over the remaining 2 Tbsp olive oil. Ladle the soup into bowls. Top with a dollop of the parsley mixture in the middle, and sprinkle the Parmesan cheese over top. Click here for the full bread recipe.